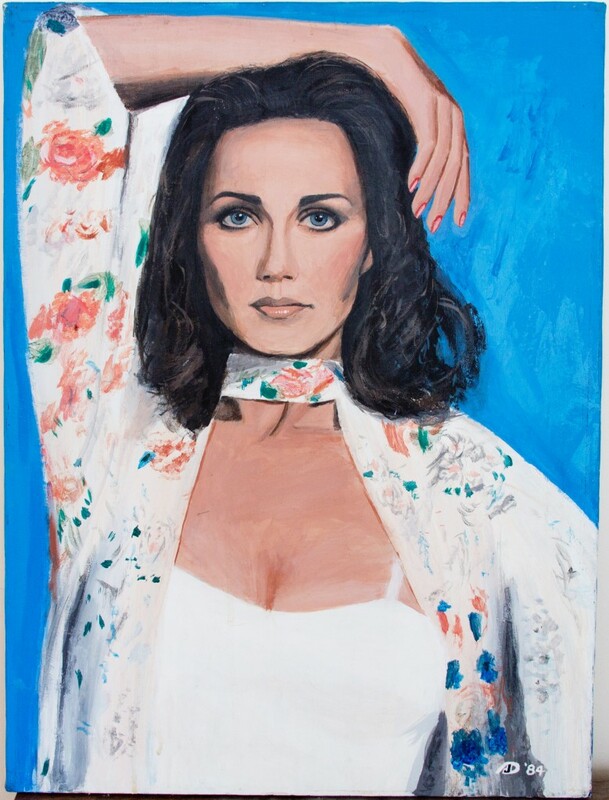 My Paintings: Lynda Carter – Nerdwatch! By Captain Nerd | August 28, 2012 - 8:18 pm | August 28, 2012 artistic things!, cool things!, hot things!, neat things! Here is another of the paintings I made when I was in college, many many (so many!) years ago. This one is also acrylic on canvas, and like all the others (which you haven’t seen yet, unless you went to my DeviantArt page!) it’s based on a photograph of Lynda Carter I saw in a TV Guide from about 1982. What I really like about this picture is that it’s one of the very few from the time where she’s photographed while not wearing her “Wonder Woman” costume! I have to admit I was never much of a fan of her “Wonder Woman” TV show, but I surely was a big fan of Ms. Carter! Besides her obvious characteristics (Sexism alert! ^__^), what really drew me to this photo and to the actress herself was her eyes. They say that “the eyes are the mirror of the soul,” but all I know is I had no trouble gazing into those beautiful eyes for hours, desparately trying to capture in pigment their appearance, their depth. I don’t know if I did her justice, but I gave it my best shot! My hat’s off to the anonymous (or at least uncredited) photographer for catching on film a fantastic pose, and wonderful expression. Tagged actress, beautiful women, beauty, Lynda Carter, model, Wonder Woman. Bookmark the permalink.